The appellation of DO Conca de Barberà is another one of the Catalan regions that doesn’t often see a lot of attention. Being in the interior, about an hour and a half due west of Barcelona, it is often overlooked for both the coastal regions as well as those more “fashionable”. The name “Conca de Barberà” literally translates to the “basin of Barberà” in English and anyone who visits will readily see that the region sits in an area between several sets of mountains with the Francolí and Anguera rivers bordering it. While buffeted by these mountains, the region lends itself to being more Mediterranean than Continental due to wind currents that come in from the sea. Despite being relatively unknown to wine drinkers outside of Catalonia, wine has been definitively produced since the 12th century with the establishment of religious orders such as the Monastery of Poblet which in and of itself is worth a visit to the region. Like everywhere in Europe, the later 19th century saw great ruin arrive to the region in the form of Phylloxera but these villagers were some of the fastest to bounce back and establish cooperatives very early on and have a wonderful collection of five Art Nouveau cellars designed by either Cèsar Martinell i Brunet or Pere Domènech i Roure that comprise the “catedrals del vi” or “wine cathedrals” found in Catalonia. The main workhorse grapes in the region for reds are Tempranillo, Grenache, and Cabernet Sauvignon while for whites it’s Macabeu, and Parellada. But one red grape that’s really comes of age in recent years is Trepat, an ancient grape considered to be native to the region that has been serious inroads in terms of quality wine production. 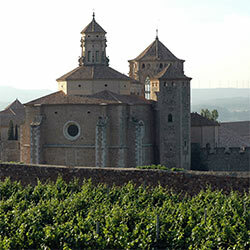 The wines overall, like great swaths of Spain, have modernized and are at an international level in terms of quality. They’re definitely worth trying if you’re looking for something a bit different from Catalonia which you may know well. Please peruse more articles about the wines of Conca de Barberà.